So since my last update – we have finally managed to stretch from 3.5 hours to feeding every 4 hours. As I mentioned last time, Rio was super happy with the 3.5 hour routine. 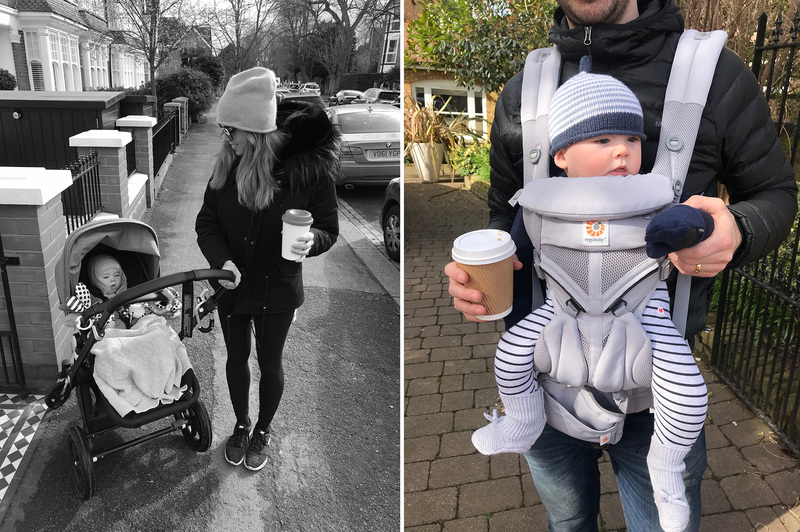 However I was conscious that I eventually had to get him onto the 4 hour routine at some point before 6 months, to start spreading out the feeds – so during the last month, I have slowly been transitioning him over to this. It really didn’t work for us the first time I started it – interrupting his sleep (especially during the night) and made him quite agitated in general. So I reverted back to 3.5 hours for a few days, and then re-tried again the next week. It took a lot longer for both him (and me) to adjust to the new timings and routine – with spreading out the feeds and one less proper nap overall (now replaced with a cat nap instead) – but I’m happy to report that we got there in the end, and now he’s really thriving with this new routine. So in total there are 5 feeds in one day (including one cluster feed), 2 main naps (morning and afternoon) and 1 cat nap in the afternoon, which I’m eventually aiming to cut out in the next month or so. The initial struggle with this new routine, are the naps, and relying on him getting enough sleep in the two main ones. There have been many occasions where he’s not slept enough in one of the naps, which means I’ve just had to bring forward the following nap. So I am finding myself being a bit more flexible in this new routine (in general, I’m finding myself way more relaxed with everything) – and although we’re still following the timings, I’m also learning to take his lead as well. Ah sleep… The most frequent question fellow parents always ask is how your baby is sleeping. Well, not a lot has changed since the last update, to be honest. To recap: he goes down at around 7pm, and wakes up one time during the night (anytime between 1-4am for a quick feed), and then up again at 7am, when we start our day. I mentioned last time that for me, this has been totally doable. I simply get him from his nursery, feed him in our bed, and then pop him back again in his nursery. However, I am happy to report that we’ve had a few nights where he’s slept right through, for 12 hours straight! Granted, this was only a couple of times, but naturally, we were super excited and thought we might have cracked it. Now, the timing of this was days before our impending holiday to Dubai, which was slightly unfortunate, as I had anticipated that our current sleep schedule would go out of the window, due to the travelling and 5 hour time difference. Sadly, I was right. And during our holiday, we were back to one (sometimes two) feeds a night. 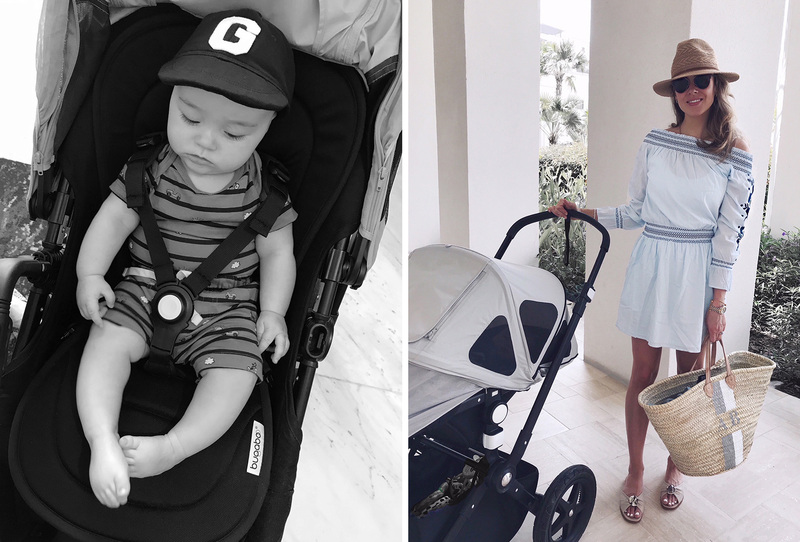 I will go more into detail about our routine (or lack thereof) during our holiday in a later blog post; but to summarise, we simply decided to 100% take Rio’s lead whilst on holiday, due to the jet lag, time difference and change of climate. Then, after we got back from holiday, Rio was struck down with tonsillitis, and naturally, all sleep went out of the window. Since stepping off that plane in London, I basically didn’t sleep properly for over a week, with Rio waking up on an hourly basis. Since he had such high fever (close to 40 at one point), we decided on keeping him in our bed for a few nights, as we were constantly having to monitor his temperature. Obviously, my main priority was to ensure he got well, and I was feeding on demand whenever he wanted it (basically, all routine went out of the window that week). Then after a round of antibiotics, he got better, and slowly, but surely, the normal sleep pattern has fortunately returned. 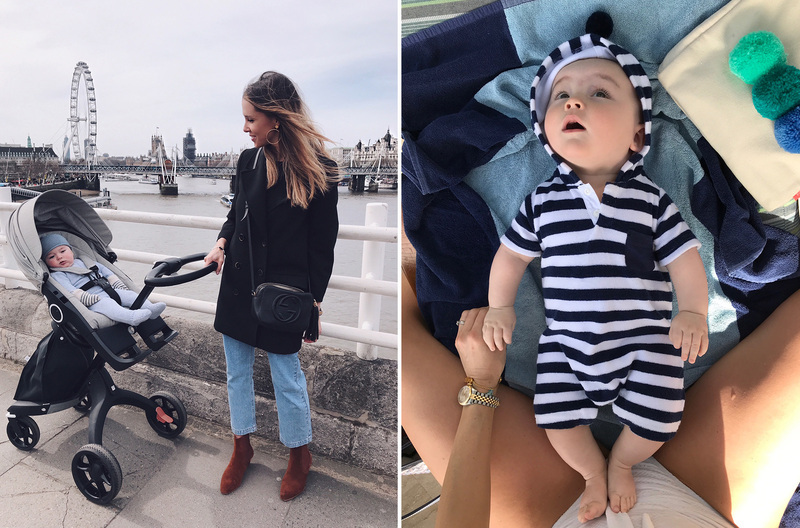 I get a lot of questions on my Instagram about breastfeeding – how I manage doing it exclusively, my tips and advice for doing it in public (check out my Nursing Friendly Style Edit) – and whether I’ll start introducing formula at some point. 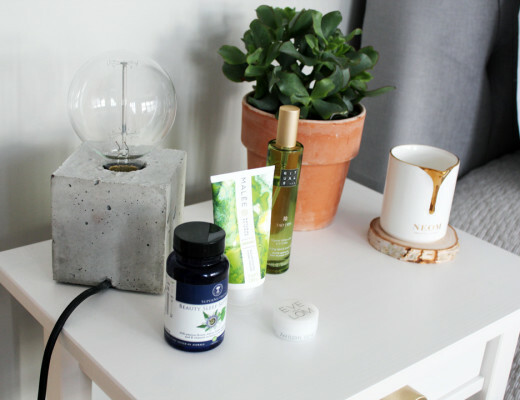 Reverting back to the topic of sleep – I know many people say that formula milk can really help babies sleeping through the night, but at the moment I’m still happy exclusively breastfeeding (and ideally want to continue that for for as long as I can manage). 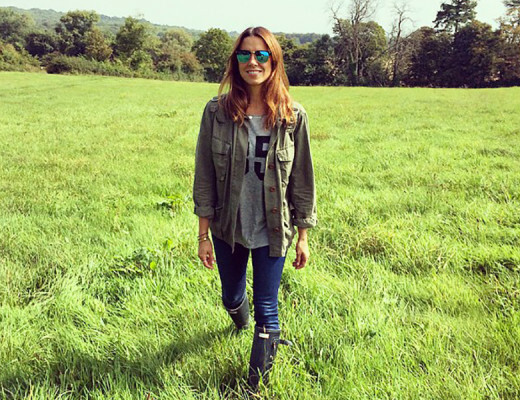 The main reasons for this, is the connection and bond I have with Rio from it… It’s an incredible feeling, and although breastfeeding hasn’t been plain sailing the whole time (with two rounds of Mastitis, Rio’s double tongue tie and being constantly sick with four rounds of Antibiotics) – it feels very rewarding that we got there in the end. Then there is the ease of breastfeeding of course; no equipment, sterilising or heating up needed. Now the main issue we currently have, is Rio no longer taking the bottle. As I got Mastitis during the first few weeks of having Rio, we had to give him a bottle when he was less than 2 weeks old (with my expressed milk), and since then, he has always managed to take one. We would give him bottles on a sporadic basis (if I wanted a drink, or if he was being looked after family). Then suddenly, around the 4 month mark, he just stopped, and from there on, he has been refusing the bottle every time. It was a combination of not wanting to drink from it, but also not knowing what to do with it. So strange, and incredibly frustrating (and has made me feel quite stuck to be honest). Looking back, perhaps we should have been more consistent with the bottle, given it to him a couple of times on a weekly basis? I definitely know that for next time time with our second baby, we will be bottle feeding from early on, and on a much more frequent basis. But we’re not giving up, and for the past week, we’ve been trying him on the bottle every day. We have gone through so many different brands of bottles (Medela, MAM, Tommee Tippee, Minbie…), and he’s currently having the best progress with Philips Avent (but that might change next week, who knows!). In terms of pumping, this is something I have also been doing more sporadically (as and when needed). Although a few months back, when he was still taking the bottle, I started getting into a good routine of pumping one bottle every day at the same time (consistency is key to pumping) – to help with my milk supply, and build up a good milk storage in the freezer. Now that he’s been refusing the bottle, I have been pumping less – but I’m finally back on it this week, as I refuse to be defeated with the bottle feeding. I use the Tommee Tippee Electric Steam Steriliser to steam everything, Medela Swing Breast Pump and the Medela Pre-Sterilised Pump & Save Breastmilk Bags to freeze down the milk. Then we’re currently trying the Philips Avent BPA-Free Feeding Bottles. We started slowly introducing some food a few weeks back. I know a lot of people talk about weaning as either something great, or something they dread. Although I love breastfeeding, and the thought of Rio wanting to stop that anytime soon, fills me with fear – I was actually quite excited about starting giving him some food! 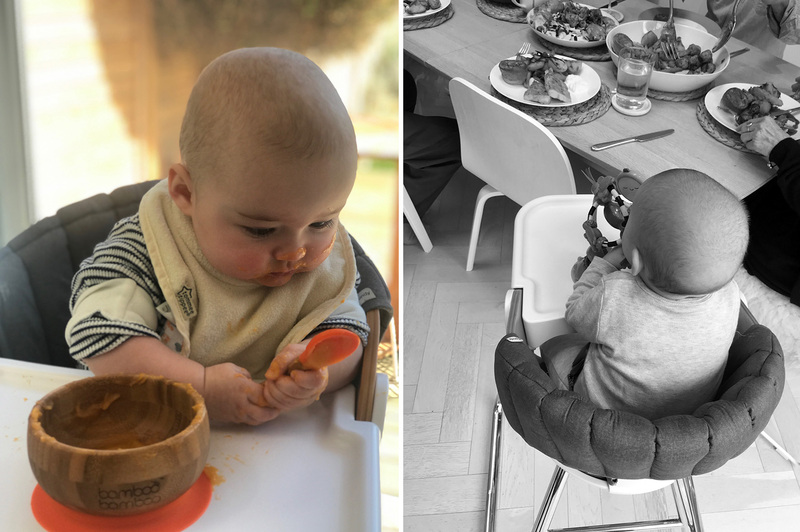 Albeit slightly daunting, as I didn’t really know where to start, or know if I was going to do Baby Lead Weaning or traditional spoon feeding (or a bit of both). Fortunately, I did a quick introductory course a month back, and equipped myself with the ‘Weaning Made Easy‘ book – and dived straight in! There was no surprise, with Rio being quite a big (and hungry) boy, that he was equally excited about solids. From day one, he has shown interest in any kind of food and loves drinking water, so that was a good start. As I started when he was 5 1/2 months old, I did everything very slow, and little by little. I also didn’t attempt BLW at this stage (they have to be 6 months old to do this), so it’s only been spoon feeding with purees so far. Although in the beginning, Rio wanted to take charge of the spoon to feed himself (which I let him – SO messy though!) – but after a week or so, he got a hang of the spoon feeding, and figured he would get more food by letting me feed him. So it’s going quite well at the moment, and we’ve now hit the mark of venturing into some finger foods, which I’m excited about (albeit, I am a tad nervous about feeding him actual chunks of food). My plan is to stay as relaxed as possible with weaning, taking some lead from him, and mixing both BLW and spoon feeding. I know that traditional strict BLW don’t like you using any spoons at all, but I think this balanced approach is going to be the best method for us. For now anyways – let’s see where I’m at with it next month! Not loads has changed since my last update in terms of his favourite toys, gadgets and activities. 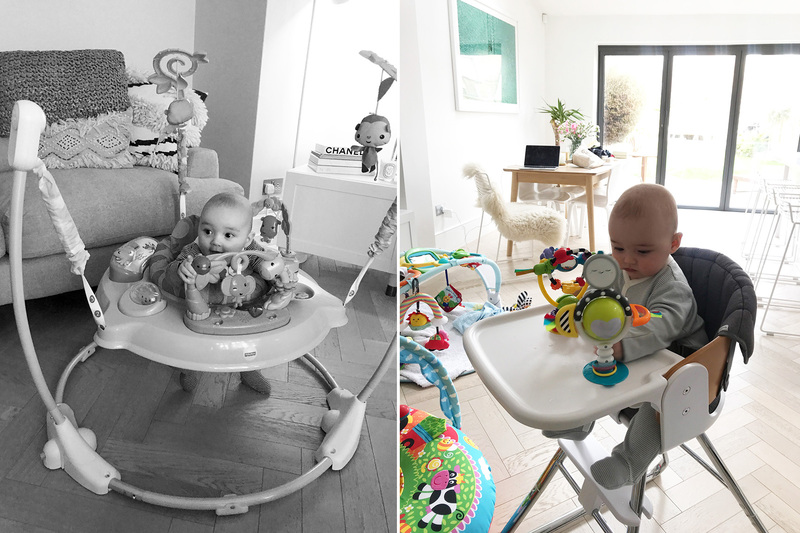 We have acquired a few new toys – most notably the Jumparoo. I remember a few months back, I was getting a few DM’s on my Instagram about this (when I was having a bit of a moan about the colour/toy invasion). I now understand the comments; yes, it’s a beast of a playstation, but he absolutely LOVES it, and happily bounces and plays in it for ages! As he’s safely secured in it, it gives me some free time to get on with some housework/cleaning up/work. Another thing we have been doing more, now that he’s a bit older, is reading books, and as always, lots of singing and nursery rhymes. It’s so rewarding watching him recognise the stories and songs. We’re still going to music classes, and our next term with Baby Sensory and Monkey Music starts next week, which he really loves. Rio has been super strong from the get-go, but he’s still not sitting up unsupported, so we’ve been working a bit on that, as and when he’s in the mood. With his strength, his swimming is also amazing, especially after our holiday to Dubai, when we popped him in and out the pool and ocean all day. He just loves it! I have definitely felt the need of having a bit of ‘me time’ every now and again. Even just sitting down on the sofa with a cup of coffee for 20 minutes while he sleeps, can be enough. But also finding the time to work out, which I spoke about in a recent blog post, has been really key for me. Not so much because I want to loose the baby weight, but because I want to feel strong and fit again (nothing can quite prepare you for what a 10-month pregnancy does to your body, and how weak and fragile it leaves you). I now truly understand the saying: “Happy Mummy, Happy Baby”. 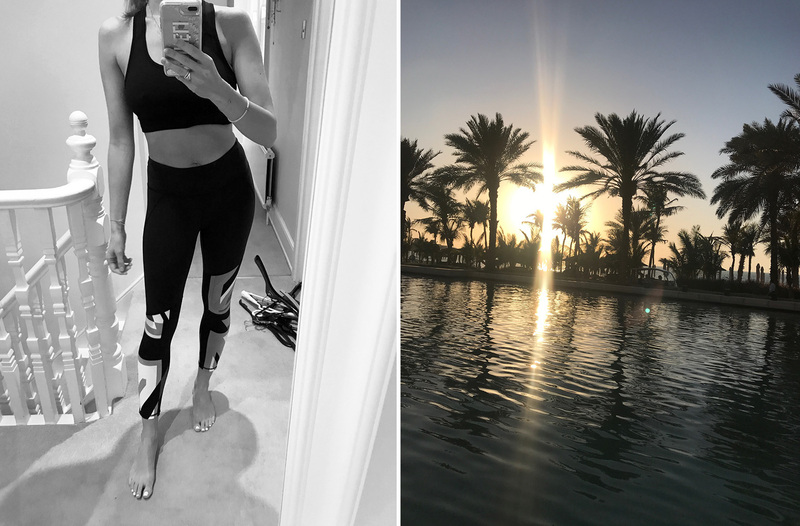 The more I get the chance to re-focus a bit back on me, be it for my overall wellness, fitness goals or just general headspace, has made all the difference. I have also started blogging again. 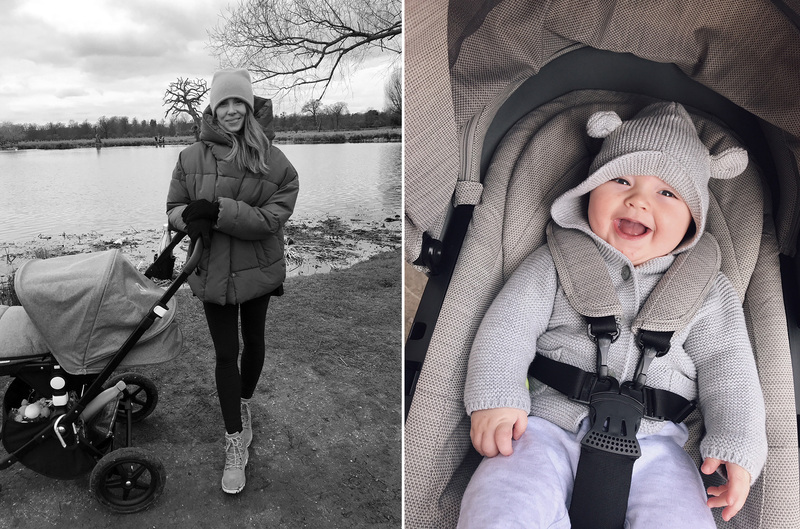 Obviously, Rio is my number one priority – but when I can find some spare time (planning around his active playtime or sleep time), I am really enjoying shooting, and writing content for the blog (I hope you enjoy it too!). 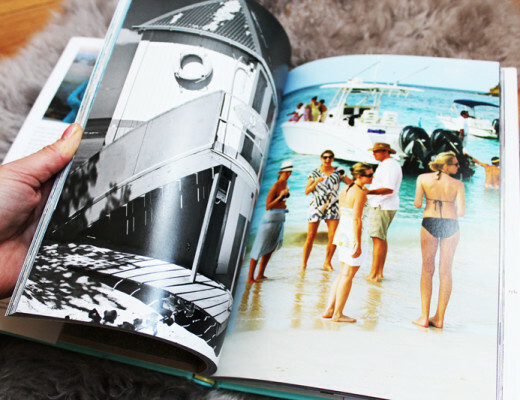 It doesn’t really feel like a job any longer (although it never really did, as I’ve always enjoyed it) – but now, it’s truly become a real escapism for me. A time where I can be creative again and feel like I’m really challenging my brain. It feels so good, and since carving out some time for both my body and mind, I feel like I in turn, have become a better, and more dedicated mama. 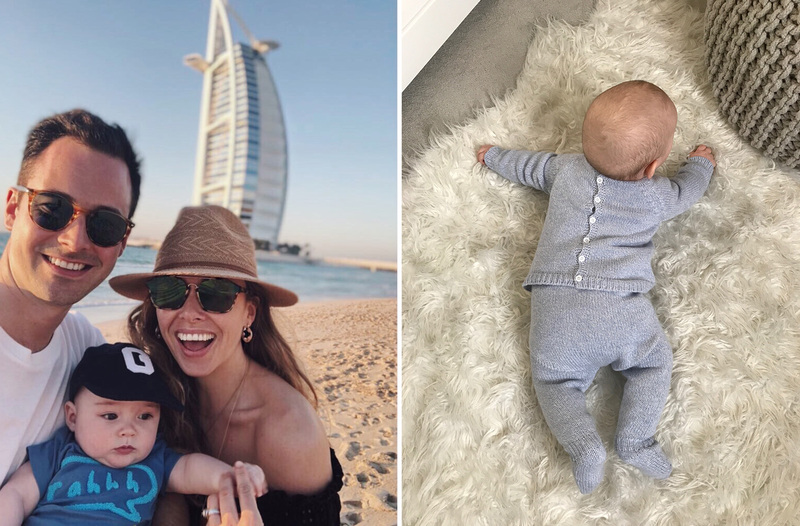 I have had so many request to share my tips and advice for travelling with a baby after my Dubai holiday, and although I’m by no means an expert after just two holidays – we did learn a lot after our travels, so I have decided to dedicate a whole blog post on this – with all my do’s and don’ts so far. It will be live this month! Anneli, Rio is just so cute. My son also gave up on the bottle at a certain point, so we switched to sippy cups and it worked like a charm! This is such a useful article, especially to a tired momma of a clingy 2 months old baby girl. This gives me hope that in a few months my baby will enjoy playing more and we’ll be able to do more fun activities together. I always enjoy reading your articles. So useful Anneli, thank you! You are a fantastic mama and he is so cute! I had 2 bottle refusers, I had a lot more success with just the cheapo tommy tippee beakers once they were 5 months plus. For some reason they seemed to like the complete difference from the breast rather than the more realistic bottle. Plus the beakers are free flow so no effort involved on their part! We are just about to start weaning! I have some books but could you recommend any equipment please? E.g. Bibs, steamer for veg. Thank you so much.